Got 20 minutes? 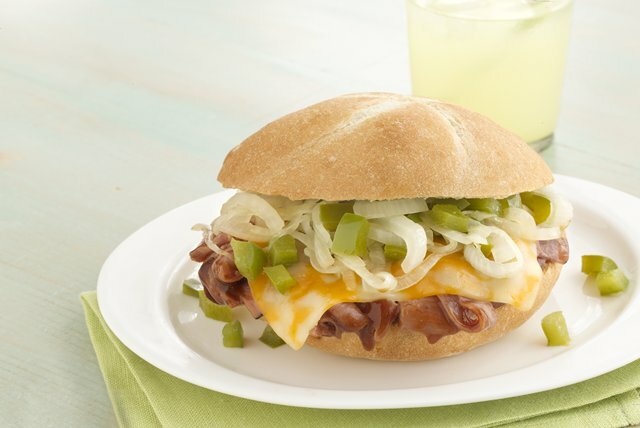 That’s all you need to create a melty-cheesy BBQ-beef sandwich that’ll make the neighborhood deli jealous. Heat oil in large skillet on medium-high heat. Add vegetables; cook 6 to 8 min. or until crisp-tender, stirring occasionally. Remove from skillet; set aside. Add meat and barbecue sauce to skillet; cook on medium heat 2 to 3 min. or until heated through, stirring frequently. Spoon meat mixture onto bottom halves of rolls; top with cheese and vegetables. Microwave on HIGH 30 sec. or until cheese is melted. Cover sandwiches with top halves of rolls to serve. Prepare using chopped red peppers. Substitute OSCAR MAYER Deli Fresh Oven Roasted Turkey Breast for the roast beef.